Update: Congrats to the Connecticut Huskies. This app has been removed from the App Store for now, and it should be back up again for the 2012 college basketball season. 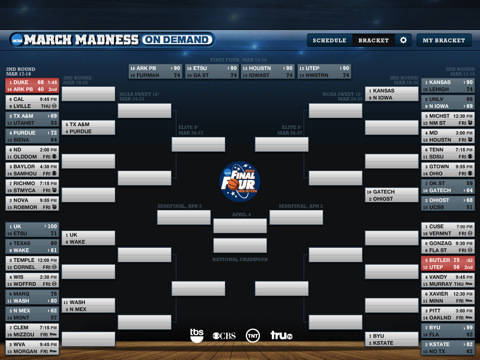 NCAA March Madness On Demand is a universal iPhone and iPad app that lets you watch March Madness basketball games live, and follow your brackets. The NCAA app is free and only has ads to support its live video feeds. All the games from the First Round, Sweet Sixteen, Elite Eight, Final Four, and the Championship game are included. There is a slider on top of the page that you can use to easily swipe & view scores in other live games and switch to them quickly. On the iPad is where this app truly shines, but on the iPhone it works quite similarly as well. When a game is live, you can tap to start watching the game in a smaller window in the middle of the iPad screen. After a game has finished you can still view the box score, along with team leaders and watch video highlights of the game. On the iPad, you can’t go into full screen mode with the video, probably because the video has to be supported with the ads shown below it. On the iPhone, the video pretty much fills up the entire screen, sans the scoreboard and navigation bar. If your network connection (3G or WiFi) drops to slower than required speeds, the app automatically switches to an audio only format until your network speed picks up again. You can pause live game videos and even rewind them using this app. The scores shown above the live video feed are not updated in real-time, but are only a few seconds behind the live video feed, so don’t be alarmed if they are not in perfect sync at all times. You do need to enter an email address to start watching the free games. Tap the Bracket tab to get a nice table of the entire series broken down by round and region. All the items on this bracket page are hot links, so you can tap any game matchup to get details on that item. Wanna track your bracket progress? Go into the My Bracket section and you can sign up for and manage your picks via the official NCAA.com March Madness Bracket Challenge. Keep in mind that the brackets are locked after March 15th so you can’t edit anything after this time. The app helps you find local TV listings (TBS, CBS, TNT and truTV) in your area, searching using your ZIP Code. Push notifications in the app can alert you of tip-off, overtime and more. 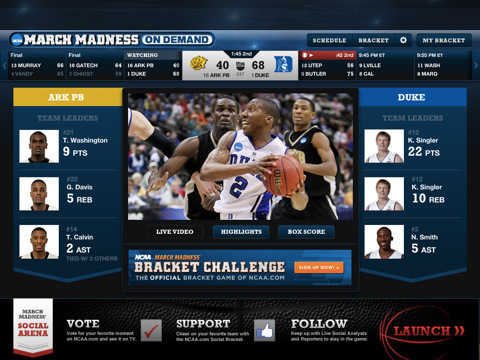 NCAA March Madness On Demand is a perfect companion for your iPhone and iPad to follow along with all the action. Everything works as advertised and nothing to complain about. A beautiful user interface, fast responsive navigation, and best of all free live videos. My only recommendation would be to make sure you are on a WiFi connection when watching live feeds for best results. Be prepared to spend hours watching games. AppSafari review of NCAA March Madness On Demand was written by Joe Seifi on March 28th, 2011 and categorized under App Store, Featured, Free, iPad apps, Sports, Universal, Video. Page viewed 4130 times, 2 so far today. Need help on using these apps? Please read the Help Page.